The orange Floating Wrist Strap from Ruggard is designed for use with waterproof point-and-shoot cameras and other waterproof devices. Its brightly colored 6" flotation padding allows your camera to safely dangle below and is also easy to spot in the water. A plastic push button slip knot is used to tighten the 1/4" nylon strap around your wrist. There's a quick release connector with a loop that detaches from the main strap and threads through your camera's strap lug. Back thread the loop through the lug, reconnect the quick release connector to the main strap and you're ready to go swimming. Each side of the main strap is 3" long. Dual faux-leather panels adorn the sides for a touch of style. The Floating Wrist Strap is backed by Ruggard's limited one-year warranty. 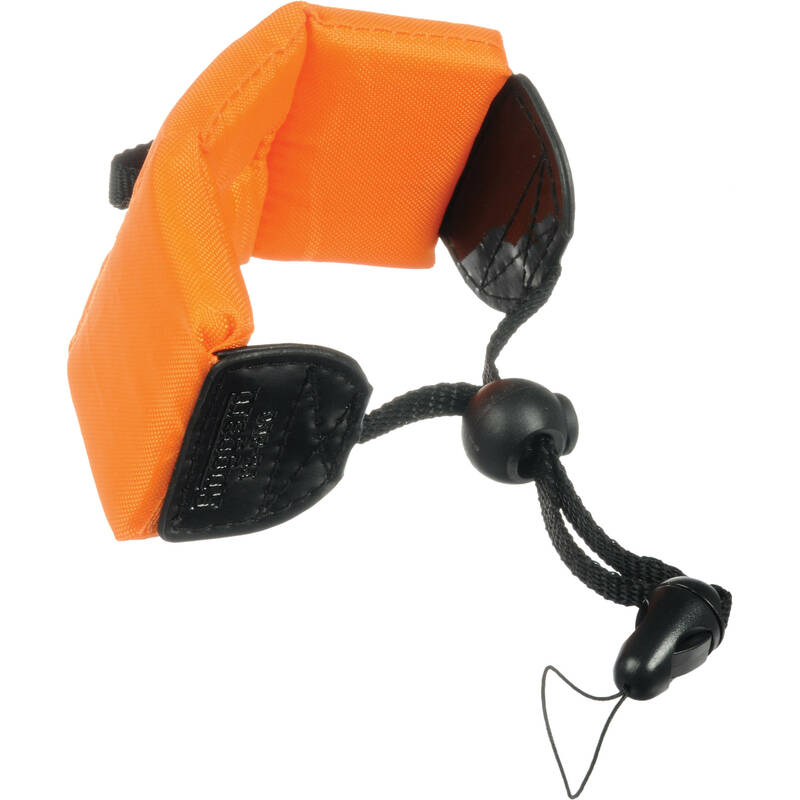 Box Dimensions (LxWxH) 9.0 x 2.0 x 2.0"
Floating Wrist Strap (Orange) is rated 4.7 out of 5 by 94. Rated 5 out of 5 by Russ from Fish Stole Camera While snorkling in Bora Bora, taking pictures with nearby docile reef sharks, the camera got loose; I thought the camera was safe, since the strap kept the camera from sinking to the bottom. However, one of the reef sharks seemed to mistake the floation strap for a fish, and bit it and took it away. Never did recover the camera. Would recommend using this in addition to the small strap that comes with the camera, rather than using just the floatation strap alone. Rated 1 out of 5 by Paul from Good idea; Breaks when you need it The idea is excellent! Used for snorkeling fine, BUT... First time in whitewater, the connecting snap broke under what I regard as very modest load. In retrospect, the snap is clearly under-engineered: they need to bulk up the snap. Spend 3 cents on the plastic snap instead of 1. Sigh... (Hey it's under warranty! Oh wait, I can pay as much to ship it back as it cost to get it.) The good news is I caught the camera. I don't hate it, but it didn't work for me. I would not again trust it to hold a camera I valued. Rated 5 out of 5 by Larry M from Will support 8 oz. A float is essential for an underwater camera. Else you could lose your investment AND those great photos you've taken. So I bought a big float at a boating store. It wasn't until after several uses that I wondered whether the float would actually support the camera. A five-gallon bucket provided the test site...and the camera sunk. It was easy to find the weight of my Canon D20 camera, 8 oz., in the manual and online. Lots of sites sell these floats but B&H is the only one to actually list what weight each supports. The other review comments apply--the wrist strap is huge and doesn't necessarily tighten enough for small hands but it works fine for me. Rated 5 out of 5 by Mimi of 3 from Pink Floatation Strap!!! It's PINK!!! I bought this flotation strap because its PINK!!! It's the perfect shade of pink. It does the job, and its like getting one custom made because its not the standard orange or yellow. It comes with a quick release strap so it's convenient to put it on when needed. I take it to the Water Park and get great pictures of my Grandbabies on the Lazy River. Did I mention it's PINK??? Thanks for stocking this B&H! Rated 5 out of 5 by dockmaster dave from the price is right! fits right on wrist,size is enough to float 850sw ,dries fast. Rated 5 out of 5 by Stacy Bayless from Simple and useful Comfortable, strap has a sliding adjustment to tighten to your wrist which is useful if you still want use of your hands while snorkeling. I could 'drop' my camera out of my hands and still swim! The floating part of the strap easily snaps on and off so it's not in your way when just walking about town... but it seems sturdy. Rated 5 out of 5 by Dave in the water from Money Well Spent No matter how well you swim, cameras sink faster than you can swim. This device allows you to relax and enjoy your camera in water environments. The added buoyancy is not so strong that you can't submerge the camera when snorkeling and the strap fits nicely around your wrist for security. could this keep a speaker that weighs a pound and a half floating? What weight will this strap support? Looking at an Olympus Tough TG-4.